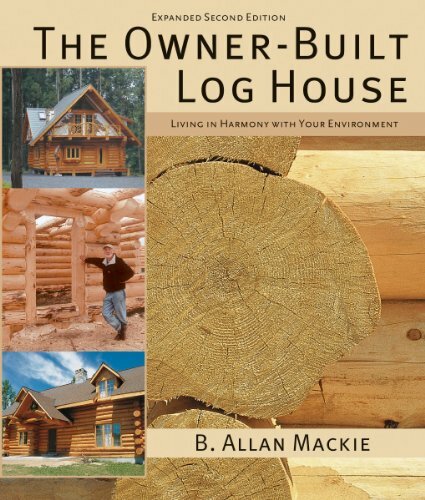 "B. Allan Mackie demonstrates to anyone who has ever dreamed of having a log home that ownership is within reach." A decade ago, B. Allan Mackie was nearing completion of Ardea, the log house he built on Shanty Lake. He shared these experiences in the original edition of The Owner-Built Log House. In this new edition he continues his personal journey, which led him to complete Ardea and realize he had yet to build the perfect log house. This book is a testament to Mackie's most treasured desire -- to reproduce the life and style of the pioneers. In this unique book, Mackie provides a thorough, expert and practical guide to building a log house. He demonstrates that, with the will to learn, the average person is more than capable of building a log house that will serve for years to come. Mackie also carefully addresses such issues as building ecologically and harvesting trees. This new edition of The Owner-Built Log House includes a new chapter that covers the building and finishing of two additional log houses, which were only in the planning stage when the original book was published. Over 30 photographs take the reader carefully through the process of building the author's main house at Shanty Lake as well as a new and smaller retirement home in which the author currently lives. B. Allan Mackie is recognized around the world as one of the foremost builders of log houses. He teaches log building throughout North America and in Europe and Asia. From the dawn of human history, people have used trees and rocks to build the shelters they needed. By the time tools had developed enough to be able to shape and refine stone, men would already have had tools capable of shaping wood. Therefore, wood is among our oldest building materials. And I believe that everyone in any pre-history community would have been familiar with the ways of log building. It would be a skill as important as hunting, food gathering and fighting. This was not a matter of fashion for them, as it is for us. It was a matter of survival. How welcome, and what a blessing those shelters must have been! And from those ancestral feelings of gladness toward the tree-walls which protected them, come our own feelings for log buildings. When I first started to teach the skills of timber building in 1970, I was not fully aware of this phenomenon. It sometimes annoyed me that people interrupted my work to tell me the "only way" to build with logs, when I could see that their information was the product of fantasy or faulty folklore. I would try to change their minds, so that if they tried to build in the future, they would build better houses. But often they wouldn't listen. They would go away angry and hurt. Then, slowly, I began to realize that they were coming to me to share a dream. It was the dream I should discuss with them, in its proper place: why we love log buildings. Later, when their minds were resolved to build, I could teach the correct methods for building. When I built the Kerry Street House in Prince George, British Columbia, in 1973, one of my students was totally inexperienced. At one point we needed him to pass a sledgehammer from the second floor to the roof structure we were framing and he didn't even know how to tie it to the rope we lowered to him. I became increasingly frustrated by my inability to explain this verbally. Finally, he defused the situation by falling off the building. The next year, when I was in the Eastern Townships of the Province of Quebec, he contacted me and asked if I would like to see the house he had built. I did and saw that he had done an excellent job. I have learned a lot from students and I learned right then to respect everyone's dreams, no matter how impractical they may seem. There are many dreams within the big dream of living in a log house. One is for young people: they see their energies invested in the beginning of their worldly estate. They see themselves with the wind in their hair and the sweat on their foreheads glinting in the sunlight as they express their joyful hopes for a good future through hard work. The best of dreams! Others, like doctors and teachers, see a health dimension. Carpenters, construction workers and accountants also seek to cure something in their work lives that is not satisfying them. Many see the log building as merely possible: something that looks easy that they can build without a heavy mortgage debt. All of these dreams are worthy of respect. And I believe that all of these dreams arise from our deep ancestral needs to feel again the sheltering warmth of the logs, to smell their fragrance, and to know that within those tree-walls, we are safe. All these students had much to learn. They had to learn everything! If pre-screening had been allowed, my students would never have passed the entry requirements. But I knew from the beginning that all I needed in students were their dreams and their determination. So I have never refused entry to a student. And so, for these reasons, the log house becomes the most personal house. It is not only a true reflection of the builder, but it also binds the builder to nature because of the materials he uses. He cannot dominate those trees, and say, "There! I will force you into this space, whether you like it or not!" It just won't work. The builder must enter into a dialogue with the trees and discover their essence: how they might fit, are they big enough, small enough and so on. When the builder and the tree understand what is needed, they work together in harmony, each aiding the other. This builds an intense appreciation and love of building. You're never all by yourself as long as you have the ancestral dream. This reassures you that many others, just like you, have built their own log homes; therefore, you can too. In actual practice, you're never really alone. To be independent does not mean that only you must do every bit of work, little or large. This is not a competition. You will find that another person, or your whole family, or a dedicated group will stand by to help you. Do as much as possible by yourself because this provides you with a single-minded purpose. For example, if a contractor is involved, a new purpose is added: his purpose may be profit, or convenience in his work schedule, or experimentation using YOUR log house. Be aware of that and keep your own purpose clearly in mind. You'll know very early that the real reason you need a log house is to heal or strengthen your soul by providing a true place for your heart to touch (ever so gently) nature, to which we are all connected. If you believe this, as I do myself, then you will agree that it's necessary to experience as fully as possible the hard work, the sweat and blisters, the worry, the thrills, the hopes and the pride of accomplishment in your new log home. If you allow someone else to do much of this work, you will give away part of that wonderful opportunity to stand close to your ancestors. You will feel, too late, that you have been robbed of your chance to bond with the nature of the experience. But if you perform most of the work all by yourself you come that much closer to realizing your goal of working in harmony with nature. One group of workers belongs with you: your family. For they, too, wish to stand close to your shared ancestors, and to experience the log house as you do. The days you spend together working the wood will always be with you. Can you, one small person (even with a family of helpers), expect to build a log house to a good standard of quality? My answer is "Yes you can," even though there are big logs to be lifted, logs you cannot budge. There are dangers from the machinery, from the sharp tools, the unfamiliar heights, the weight of the logs, even the costs. But still I say, "Yes, you can build a log house all by yourself." Many have done so: thousands of people. Some were in their mid-seventies; some were children. Men and women alike, they built with logs and in the process built up their inner strengths. You will, of course, need those strengths as the months go by. There are many beautiful building materials in the world. The best of these are natural materials: wood, stone and mud brick. The best material to use depends on what part of the planet you're on. Mud brick or adobe, for example, is ideal in those hot, treeless regions where the soil can be baked. But I am Canadian, and trees are my natural material. I offer two definitions: natural house logs are from trees that are modified only by hand-held tools. Lumber is from trees that are modified by large power machines. Let us go deeper into our dream log house now, and ask ourselves why we want to use natural logs in construction when modern technology provides us with so many easy choices. There are three main reasons for using natural logs in construction. First, a log house is one of the most aesthetically satisfying in which to live. Logs bring the world of nature back into our lives in a way that becomes ever more necessary to our survival. There is a deep sense of peace to be had from living in a house made from natural trees. No stripped, chipped, cooked, compressed, treated or otherwise manufactured product of industrial technology can give us such an awareness of each living tree, just as it once stood.